All DuraVision mirrors are manufactured with high quality materials and stringent quality control manufacturing processes. 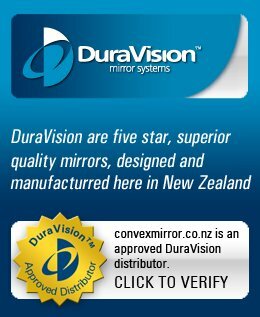 The Convex Mirror Shop is confident that their DuraVision mirror products are made to the highest standards. As a result, the DuraVision mirror range carries a 5 year warranty against faulty workmanship and materials. If a product fails due to a manufacturing fault or material defect, within the warranty period, we will replace the faulty part free of charge (excluding freight or installation costs). If it is not practical to replace the faulty part, we will replace the complete mirror at our discretion. Register your DuraVision products to receive a Five Year Warranty against faulty workmanship and materials. Click on the link below and submit the Registration Form with your Invoice Number and Date of Purchase.